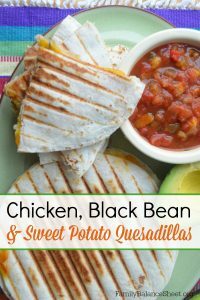 I found this recipe for Chicken, Black Bean & Sweet Potato Quesadillas years ago in a Rachael Ray magazine. I’ve been making it regularly ever since and it continues to be a family favorite. And bonus, the recipe only has 5 ingredients! 1-2 chicken breasts, cooked, and shredded or chopped. Leftover Roasted Chicken, or Rotesserie Chicken works great. 1-2 medium or large sweet potatoes. Great use for leftover sweet potatoes. Makes 3 – 5 quesadillas, depending on how much you fill each one. 1. Use leftover roast chicken or rotisserie chicken. 2. Peel and cut up sweet potato into quarters. Cook in boiling water until fork tender, about 10 minutes. Drain the sweet potato and return to pan. Add the drained and rinsed black beans and mash. 3. Spread the sweet potato and black beans over a tortilla. 4. Layer with chicken and cheese. 5. Top with another tortilla. 6. Spray a large skillet with non-stick spray and turn on medium heat. 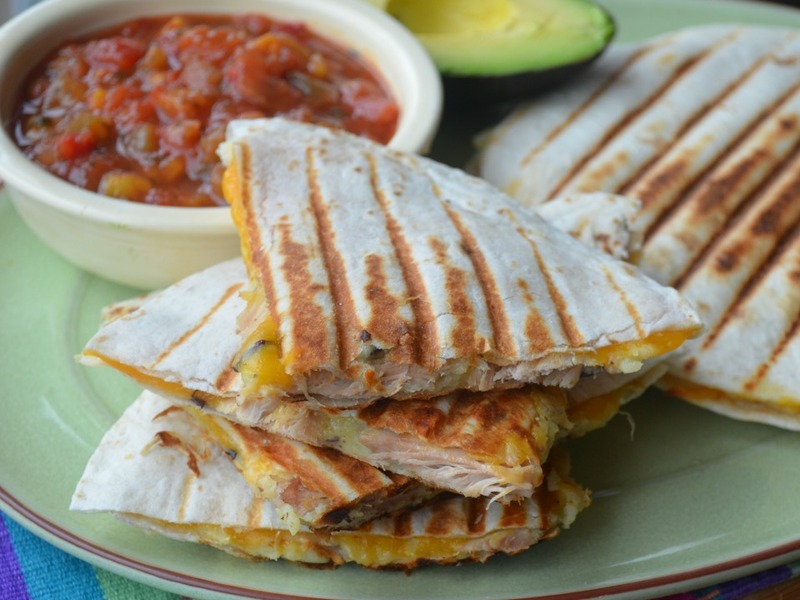 Place quesadilla in pan and press down. I have a panini press and this is where it comes in handy, but it’s not necessary. You can use a heavy pan as a press. Cook until the bottom is golden brown, about 4 minutes. Using your biggest spatula, flip the quesadilla carefully. Cook the other side for about 2 minutes, until golden brown. Add your favorite sides, like sour cream, salsa and guacamole. ENJOY! What a interesting combination of flavors! I love all those foods so I must add this in my try it file. Great idea using sweet potato. Thanks for linking your post to Tempt My Tummy Tuesday. 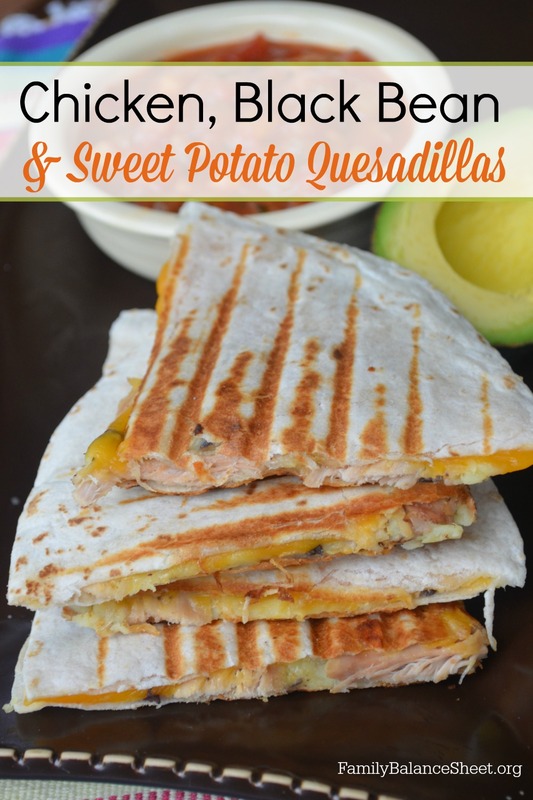 This is a nice change from regular quesadillas, they look great! this is a good recipe as a starting place. I season the bean mixture with my homemade taco seasoning and add a small can of diced green chilis. sweet potato is very good but can be too sweet. I roast cubed butternut squash that I have dusted with salt and cumin and olive oil. just suggestions. I love this recipe. Thanks you for your suggestions, Debra! Sounds delicious!